New York, NY -- In 1999, Eric Brace -- then a writer for The Washington Post -- wrote an article previewing an upcoming concert by The Persuasions, boldly declaring the group's lead singer, Jerry Lawson, to be the best soul tenor since Sam Cooke. Two weeks later, he received a pen-on-paper 'thank you' note from Jerry. The two quickly became friends and promised to someday make an album together. Years later, they've done just that. 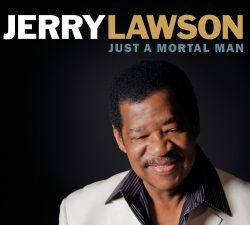 Just a Mortal Man is Jerry's first record as a solo artist, pairing his timeless, tireless voice with the soulful sweep of a full backup band. Already a familiar name in the world of a cappella music -- first with The Persuasions, and later as the leader of Talk of the Town, who rose to fame as finalists on the second season of NBC's "The Sing-Off" -- Jerry explores new territory on Just a Mortal Man, whose songs were written by everyone from Paul Simon (who asked The Persuasions to sing with him during an appearance on "Saturday Night Live" in 1977) to Peter Cooper and Eric Brace. While guest musicians like Jim Lauderdale and the McCrary Sisters also make appearances on Just a Mortal Man, Jerry is the album's star, singing with a sweet and smoky voice that's only grown richer throughout his 71 years. It's an album about growth, about pushing forward. At the same time, Jerry also pays tribute to some of his heroes, recording newer versions of songs originally popularized by David Ruffin and Bobby "Blue" Bland. With The Persuasions, Jerry reinvigorated a cappella music for a new generation of music fans more accustomed to the electrified energy of rock & roll. The Brooklyn-based group performed without a backup band, but that didn't stop them from touring with Joni Mitchell and sharing bills with everyone from Ray Charles to Bruce Springsteen. Tom Waits famously complimented the charismatic vocal group, stating, "These guys are deep sea divers. I'm just a fisherman in a boat." The Apollo Theater paid its own compliments to The Persuasions by painting the band on the legendary venue's famous mural of performers, and Rolling Stone listed the group's 1977 album, Chirpin', as one of the 100 best works of the 1970s. These guys might not have played rock & roll music, but they were still rockstars. Decades later, Jerry's star still shines brightly. Released on April 28th by East Nashville's Red Beet Records, Just a Mortal Man marks a new beginning: the start of his career as a proper bandleader, as well as his first solo release. For those who've followed him since The Persuasions' heyday, however, this is still the same Jerry: an electrifying showman and unmatched soul singer whose voice -- as well as his taste -- remains pitch-perfect. Jerry will release tour dates soon, leading up to the release of his anticipated solo album. Album will be available for pre-order via iTunes March 31.